High blood pressure, or hypertension, is a condition that afflicts a third of the American population and two-thirds of people over 65, the University of Maryland Medical Center notes. Being hypertensive means your average blood pressure is 140/90 mm Hg. Hypertension increases your risk of stroke and heart disease if left untreated. The consumption of alcoholic beverages, such as wine, is generally considered unhealthy despite any alleged health benefits. Medications such as hydrochlorothiazide, clonidine and amlodipine are examples of the many types of hypertensive medications available, according to a 2009 article in "The New York Times Health Guide," a medical reference accredited by the American Accreditation HealthCare Commission. Hypertension medications lower your blood pressure differently depending on their class. Diuretics, such as hydrochlorothiazide, lower blood pressure by helping your kidneys purge excess salt and water from your body. Vasodilators, such as clonidine, lower your blood pressure because they help open your blood vessels by relaxing the muscles in the blood vessel walls. Calcium-channel blockers, such as amlodipine, also help relax blood vessels in order to lower blood pressure. Consuming wine, or any alcoholic beverage, while you are taking any medication is not recommended. 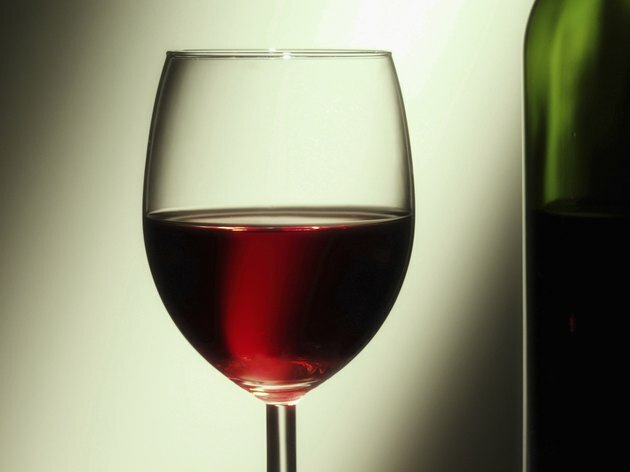 Red wine impairs your digestive tract's ability to properly absorb your medication. Drinking wine with medications will increase their effects and elevate their concentrations in your body, which increases the risk of adverse reactions and toxicity. Moreover, drinking wine with blood pressure medications elevates the risk of dose dumping, Drugs.com says. Dose dumping is when your body metabolizes medications prematurely, greatly increasing the risk of adverse reactions and even toxicity. Mixing wine with blood pressure medications will cause you to feel dizzy and sleepy, the National Institute on Alcohol Abuse explains. Drinking wine while on blood pressure medications increase your risk of losing consciousness. Furthermore, alcohol in the wine combined with hypertensive medication often causes the heart to beat erratically. The severity of the adverse reactions caused by the interaction between wine and blood pressure medications is affected by factors such as your gender and age, the National Institute on Alcohol Abuse says. Other factors that affect severity are the ingredients of the medication and the time you took the medication. Women are more susceptible to the effects of alcohol because their bodies have less water than men. Your body's ability to break down alcohol becomes impaired as you age. This means your risk of adverse alcohol interactions grows progressively higher as you age. Different types of medications peak at different rates. So even if you took the medications hours prior to drinking wine the possibility of experiencing adverse reactions remains.